Veteran activist Kisan Baburao Hazare alias Anna Hazare on Wednesday launched a fresh hunger strike at his Ralegan-Siddhi village seeking Lokpal and Lokayuktas as promised by the government. 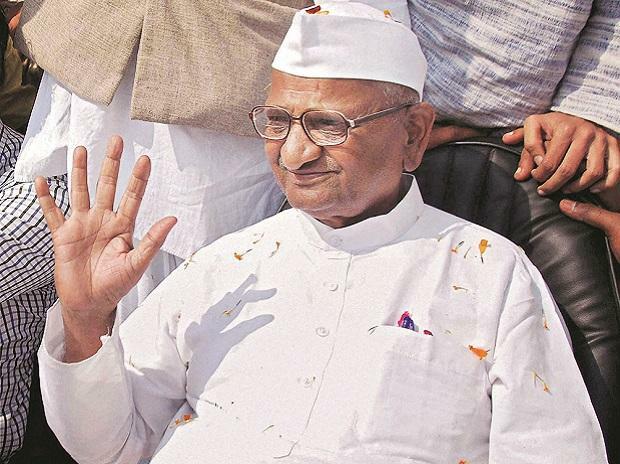 An aide said that carrying the tricolour, Hazare, 81, went around in a procession in the village with a large number of supporters and hoisted the national flag before starting the indefinite fast. He also paid homage to Mahatma Gandhi on the occasion of Martyrs' Day before launching the agitation. Three days ago, Hazare had served an ultimatum to the Maharashtra government demanding the implementation of the Lokayukta in the state failing which he would launch his hunger strike. Earlier, he addressed several letters to Prime Minister Narendra Modi to implement the Lokpal authority and said his communications were not acknowledged. Meanwhile, the Maharashtra government has initiated the process to bring the office of Chief Minister under the jurisdiction of the Lokayukta but Hazare said he will be on protest till it becomes a reality. Besides these main demands, Hazare has also taken up the farmers causes including implementation of the M.S. Swaminathan Commission Report and related issues.